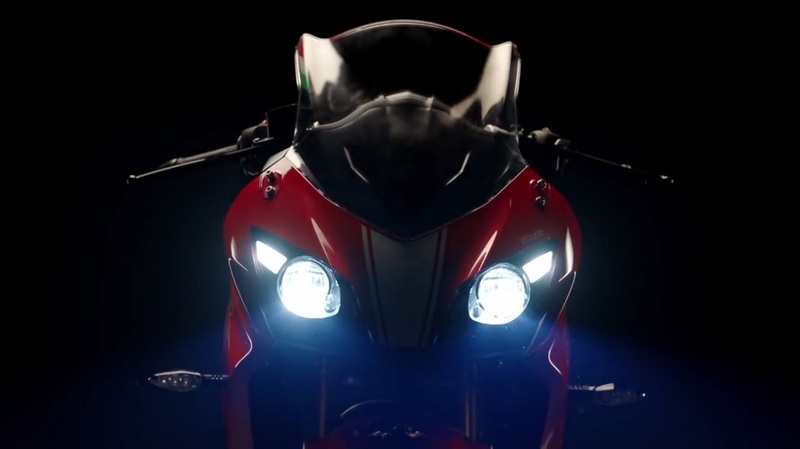 TVS Motor Company has released a teaser video of its upcoming motorcycle, the TVS Apache RR 310. The company is set to launch the motorcycle on December 6. The teaser shows glimpses of the tail section, fairing, frame and the headlight portion. The motorcycle employs a trellis frame that holds the front upside down fork and the rear monoshock. The twin headlights are LED projectors, with a large bubble-type windscreen at the top. There’s a sleek tricolour sticker on the right side of the windscreen, which gives the bike a patriotic feel. The instrument cluster is all-digital affair. The design of the bike is similar to the patent design that was leaked in August. The lighting system is all LED, a first for a TVS production bike. The TVS Apache RR 310 borrows the powerplant from the BMW G310R. The G310R employs a 313 cc single cylinder, DOHC engine with liquid cooling and fuel injection. The engine pairs with a 6-speed gearbox. It develops 34 PS of power at 9,500 rpm and 28 Nm of torque at 7,500 rpm. The bike employs petal discs on both ends for braking, and expect ABS at least as an option. The upcoming motorcycle should be priced below INR 2 lakhs, ex-showroom. It will rival the KTM RC 390 in its price bracket. Expect more details about the bike on the launch day.